Jagannath Mishra was born in the village of South Dhaka in Sylhet (Sylhet). His grandfather, Madhu Mishra, had four sons: Upendra, Rangada, Kirtida, and Kirtivasa. His father and mother, Upendra Mishra and Kalavati, had seven sons: Kamsari, Paramananda, Padmanabha, Sarveshvara, Jagannath Mishra, Janardana and Trailokyanath. (Prema-viläsa, 24). According to the Gaura-ganoddesa-dipika, Upendra was Krishna’s grandfather, the cowherd Parjanya, while Jagannath was Nanda Maharaj in Krishna’s Vraja pastimes (Gaura-ganoddesa-dipika 37). Nanda or Jagannath were, in Krishna’s various appearances, Kashyapa, Dasharath, Sutapa and Vasudeva. The king of Vraja has become Chaitanya’s father, Jagannath; the queen of Vraja is his mother Sachi. The son of Nanda is Chaitanya Gosai, and Baladeva is his brother Nityananda. (Chaitanya Charitamrita 1.17.294-295). At first, eight baby girls were born to Jagannath and Sachi, but each of them died at birth. Jagannath then performed a special ceremony to have a son, and not long afterward a boy, Vishvarupa, was born. Vishvarupa is a manifestation of Baladeva and belongs to the same ontological category that is named Sankarshan in the spiritual world. 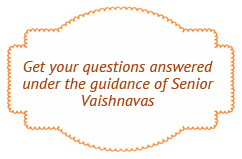 At the age of 12, Vishvarupa took sannyas, adopting the name Shankararanya. He died in the year 1509 in Pandharpur, in the Solapur district of Maharashtra. Jagannath Mishra and Sachidevi are eternally liberated companions of Krishna; thus, it is clear that their heart and body are made of pure goodness or the suddha-sattva. Another name for pure goodness is vasudeva. Krishna is named Vasudeva because he takes pleasure in the spiritual nature and makes his appearance through pure goodness or vasudeva. In 1486, at sundown on the full moon day of the month of Phalguna, at the auspicious moment of a lunar eclipse, in the midst of an ecstatic hubbub made by the townspeople filling the sky with the joyful sound of Hari! and Krishna!, the women making their uludhvani, and the gods playing on their divine instruments, Gauranga Mahaprabhu accepted Jagannath Mishra and Sachidevi as his father and mother and appeared in the holy dham of Sri Mayapur. It is said that witches, evil female spirits and other powerful demonic specters cannot go near a neem tree. Out of their feelings of maternal love, Sachi and the other women named him Nimai in order that he be protected from any inauspiciousness. Later, when Nimai took the renounced order of life, he was given the name Sri Krishna Chaitanya. Some of the other names by which he is known are Vishvambhara, Nabadwipa-chandra, Gaurahari, Gauranga and Mahaprabhu. When Sachi and Jagannath saw their child’s face, they forgot themselves in their excitement. Nilambara Chakravarti was a great astrologer and when he examined the constellations at the baby’s birth, he divined that he was to be a king among kings, that he was to possess all virtues, indeed that he was Narayan himself. Jagannath and his entire household were immersed in the ocean of ecstasy upon hearing these predictions. This ocean only increased in fullness as the baby Nimai began to display his childhood pastimes. Whenever Nimai cried, the adults would sing the Holy Names in order to pacify him. When he was only four months old, he started throwing various household articles about, but would only do this until he saw his mother when would lie down and start to cry. Sachi would sing the Holy Names to stop Nimai from crying, and only when he had stopped would she notice the disorder into which the child had put the room. Never suspecting him, she though that it must be some evil spirit whose efforts to harm the baby had failed due to the protective incantations she was always making over him. When the time came for Nimai’s name-giving ceremony, Nilambara Chakravarti and other learned men in the community called him Vishvambhara, which is thus his principal name, while the women gave him the name Nimai. This latter name was given because neem leaves have a bitter taste and are said to keep death away, and they wished to bless Nimai with a long life. The name-giving ceremony is also the occasion when a child’s tastes and tendencies are tested. Jagannath placed rice, puffed rice, gold, silver and a manuscript of the Srimad Bhagavatam before the child, who ignored everything to reach out for the Bhagavatam. All were delighted by Nimai’s choice. The philosophers amongst them began to say, “Nimai will be a great scholar.” In fact, Nimai wished to show, even at this young age, that the Bhagavatam is the supreme authority in spiritual matters. This is the teaching hidden within this lila. As Nimai grew, he began to crawl, giving pleasure to his mother and father and all their neighbors. One day, the child saw the god Sesha in the form of a cobra in the garden. He played with him for a while in the mood of a golden Narayan, and then, like Narayan, he curled up on the coiled snake and fell asleep. When Jagannath Mishra came upon the scene, he feared the worst for the child and started to shout and cry, frightening the beast that slithered away. Nevertheless, Sachi and Jagannath had seen the wondrous form that the child had displayed and became convinced that he was a divine personality. The neighborhood women found that whenever they loudly chanted the names of the Lord, Nimai would stop crying and start dancing in ecstasy, even rolling about in the dust. So every morning they would surround him and sing the Holy Names. Whether they knew him or not, people would be attracted by his beautiful appearance and would affectionately give him sandesa sweets or bananas. Nimai would take all these sweets and fruits and give them as prasad to the women who sang for him. When Nimai was able to walk, he would go into the neighbors’ houses and take milk and rice, and if he found nothing to eat, he would break various household items. This naughty behavior is a source of delight for his devotees. On one occasion, as Nimai was playing in front of Jagannath Mishra’s house, two thieves saw that he was wearing valuable ornaments and became greedy. They charmed the child by offering him a ride on their shoulders and then started to carry him away. However, they were bewildered by Vishnu’s illusory power and shortly they found themselves back in front of Nimai’s own home. Frightened by this unexpected turn of events, the two rascals ran away. Meanwhile, Jagannath had been searching anxiously for Nimai. When he saw that his child had returned, he held him tightly to his heart and felt as though his life had also been returned to him. One day, Jagannath Mishra asked Nimai to bring him a book from inside the house. When Nimai ran to fetch it, Sachi was surprised to hear the wondrous jingling of ankle bells. After Nimai had given his father the book and gone off to play, Sachi was amazed to see that his footprints held the auspicious signs of the flag, the lightning bolt, the elephant rod and the banner. Under the influence of their parental love, Jagannath and Sachi were not able to accept that these were Nimai’s footprints, but took them rather to be the traces of Damodar, their household Salagrama-sila deity and so they did a special ceremony for him, bathing him, peforming the puja and offering food. On another day, a Brahmin pilgrim passed through Nabadwip with his deity of the baby Krishna. Jagannath offered him a place to his puja as well as food to cook for an offering. When the pilgrim had finished cooking, he sat down to offer the bhoga to his deity. But as soon as he started meditation on his mantra, Nimai came and began eating the offering. The Brahmin saw this and started to shout in distress. Jagannath Mishra was extremely disturbed by the incident and the Brahmin had to intercede to stop him from giving the child a spanking. Jagannath Mishra completed the three rituals (samskaras) in which the child’s ears are pierced, his hair is shorn and his education is begun. It took Nimai only three days to learn the entire alphabet and he started to read and write all of Krishna’s names. 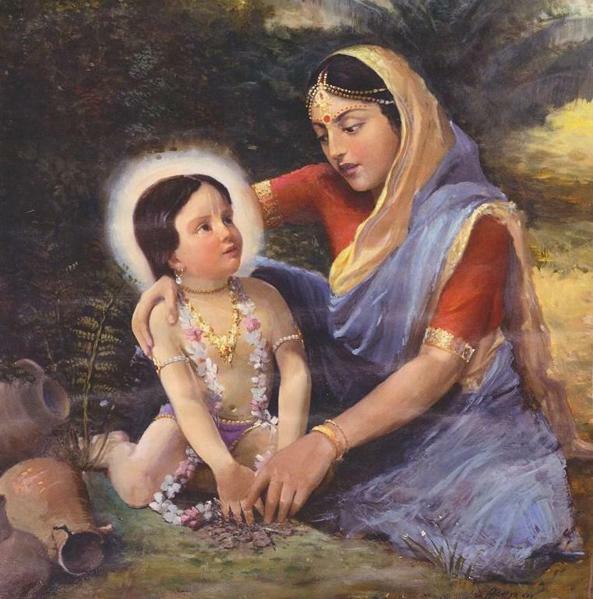 The little Gaura Gopal would often ask his parents to bring him birds, even the stars or the moon, and would cry if they could not do so. When they chanted the Holy Names, he would stop crying, otherwise there was no way to quiet him. One day, however, though they repeatedly sang the names of Hari, the child’s tears did not stop flowing. When pressed to tell why he was crying so insistently, Nimai said that though it was Ekadasi, he wanted to eat the offerings which the Brahmins Jagadisa and Hiranya had made to their Vishnu deity. Jagannath was astonished to hear this unusual request, but went to the house of his two friends. He told them the whole story, and they were delighted to give him the offering. When Jagannath brought the prasad home and gave it to Nimai, he finally stopped crying. Seeing that the boy would in no way heed her order to leave the unclean spot, Sachi finally dragged him away and made him bathe and herself took a bath. After this she and other members of the community approached Jagannath and entreated him to allow Nimai to resume his studies, which he did. Some time after this, Nimai’s sacred thread ceremony was held, after which Nimai went out to beg, just as Vamana did. Afterward, Jagannath entrusted him to Ganga Das Pandit, who is none other than the same Sandipani Muni who taught Krishna. Ganga Das Pandit was overjoyed to accept the handsome and virtuous boy Nimai as his student. Nimai would ask him and his fellow students trick questions based on Nyäya and the ensuing arguments would be a source of amazement to everyone. Jagannath was pleased to see his son take up a disciplined life in which he would bathe daily in the Ganges, perform puja to Vishnu strictly according to the regulations, and offer water to the sacred tulasi plant before finally taking prasad. Nimai would then go to a place where he could be undisturbed and would study alone. Jagannath prayed to Krishna for Nimai’s continued welfare, but at the same time was always afraid that he would come to understand the emptiness of the cycle of samsara and eventually leave home. One day, he had a dream in which he saw Mahaprabhu’s beautiful form as a sannyasi, performing sankirtan while surrounded by his devotees, dancing, singing, laughing, crying. After this he came to believe that it was inevitable that Nimai would one day leave home. Sachi Devi tried to convince him that because he had become so attached to his studies, he would never leave home, but she could not convince him. Jagannath disappeared before Nimai became a sannyasi. On the death of his father, Gaurasundara lamented just like Ramachandra did upon hearing of the death of Dasharath, but at the same time consoled his heartbroken mother.